There are over 4.5 billion mobile phones worldwide of which over 2 billion active mobile devices work on Android. Over 52% of internet traffic is generated by mobile devices. These statistics together confirm the gigantic opportunity that mobile application developers enjoy in the modern world led by mobile first. This area of development has boosted as the number of mobile users rise exponentially every year. Till now, an insane number of applications have been developed to aid the user in different tasks. If you are focusing only on building the application for the users of a single platform, then I would suggest developing using the technologies native to that platform only. Those applications requiring much hardware access would have to built individually for each platform. For example, suppose you are trying to build an application to manage the RAM utilization of the device, then you will have to develop for each platform independently and thus, you won’t be able to develop the application using cross-platform development tools. But if your mobile application is more of an interface for users for non-hardware dependent tasks, then you can use the cross-platform development tools for improving efficiency. 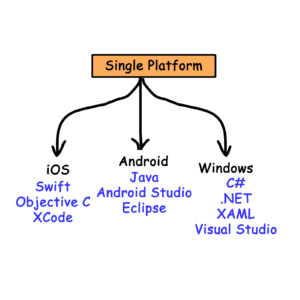 This will definitely help in reducing your total development time in creating applications for each platform. 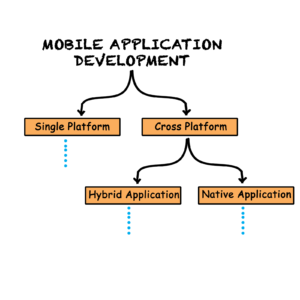 We have two types of tools for developing cross-platform applications: Hybrid Applications and Native Applications. Here we would focus on developing applications for each mobile operating systems individually using their own native tools. The top leading operating systems for mobile devices are Android, iOS and Windows Phone. According to a report by IDC( International Data Corporation) in 2017, almost 83.4% of mobile users are Android, 15.4% are iOS and 0.8% are Windows. Hence it speaks volume of how Android users dominate the entire market share and thus most developers focus their technology for this platform. Android OS, being an open source OS by Google add as one of the prominent factors for the development in this platform. Why do you want to become an Android Developer? Smart home apps, voice-activated apps, artificial intelligence and Chatbots in e-commerce, are only some of the technologies which have entered our life over the last year. There are thousands of companies who would be looking to map these new technologies to their business and present it to their customers so that they can capture the emerging market opportunities, engage with mobile-savvy millennial customers and continue to remain competitive in the market. I can hear your reservations about starting a career into a field which has innovations almost on a daily basis. So why get into android programming? Android has been around for 10 years. The framework and methodologies have expanded and bloomed over that time into a very huge framework that needs to be understood at least on some level by anyone willing to work with the system. BUT in the last year or so many of the core pillars of the daily Android developer’s work have been pretty much reset and everyone has been starting from the beginning again. The fact that the experiential application platform is filled with innovation ensures that no two days as an Android developer are the same. You’ve to keep reinventing yourself and your company’s product to stay ahead and stand out from the competition. The aim of this guide is to provide you a systematic approach to building skills necessary for you to become the first-class citizen in android developer fraternity and command a premium for your skills to earn the income and enjoy social recognition. In the first part, we focused on the mobile app development scenario and why you should learn android development. In this part, we are going to focus on key parts which would act as checkpoints in our journey to become a rockstar app developer. Java has been the cornerstone of Android development ever since Android was launched, but last year Google named Kotlin as the official language for Android applications. It has developed a huge number of practitioners for the language. While there also exist some customers who still insist on working in Java, a huge majority is thinking forwards and migrating either all code or all new code to Kotlin only. This is a very big advantage for a new developer like you because it means that the people who have been around for the last 10 years no longer have a huge head start. There were some brave early adopters but a huge portion of Android developers have been working in Kotlin only for a year or so. ENOUGH TALK, WHERE TO START? Step 0: This step requires you to be learn everything about Java and Kotlin. Yeah, you read that right. I’ve intentionally marked this step as STEP 0 because before learning Android Application Development you must have some knowledge of what exactly is Java and Kotlin. This video will help you get an overall understanding of Kotlin. This step is all about learning the context. Now onto why you should learn Java when it is not even the official language for android app development anymore? I’m just recommending you to learn Java first because you are new to Android development and Java contributes a big part of Android. And there don’t seem to be enough resources to learn all the Android APIs in Kotlin. Most of the tutorials you’ll find for the beginner on Android Development stuff will be in Java only. So, if you know Java then it would be of great help for you to understand what the Java code is doing without you plugging the code into the Java to Kotlin Converter. I would recommend developing a learning of Java from Head First Java book. This book is so attention-grabbing and habit-forming that you’ll feel like learning Java from a comic book. Get this book from here. Another good option is Thinking in Java. Get this book from here. There are numerous books available for Android development, my personal favorite which I would recommend is Android Programming: The Big Nerd Ranch Guidebook to start with. This book is entirely based on Big Nerd Ranch’s popular Android boot camps. You can use this book as a practical Android development guide as it provides really good code samples with clear and precise explanations of the key concepts. I would also recommend Head First Android Development. Though this book seems to be bit outdated, it explains the key concepts in a very interesting way. That’s it for the Foundational Layer! In the subsequent articles, we will explore the various online courses which could help you practice Android Development and also become a certified Android developer, the various tricks and practices which you should incorporate while writing code, how to integrate various libraries and APIs to make your program multifunctional and much more. Now as you can see in the picture above there are a million things that one needs to learn to be able to launch one application, don’t worry we’re going to take this journey together. As we’ve already gone through the basics in the foundation layer, we can now dive in and learn about Android Development and various concepts related to it. One of the most effective components regarding developing for Android is that most of the required tools are free and simple to obtain. The Android SDK is available for free-of-charge download, as is Android Studio, the officially integrated development environment (IDE) for Android app development. Android Studio is the main program with which developers write code and assemble their apps from varied packages and libraries. The Android SDK comprises of sample code, software libraries, handy coding tools, and much more to help you build, test, and debug your applications. So how do you learn more about this IDE? A simple, easy, and complete guide for all beginner-level Android developers who want to develop their first Android app using the de facto open-source IDE, Android Studio. Where do you learn Android Development from? This is one of the most important part of this guide. There are a million books out there for Android Development as well as a lot of online video tutorials. I’ve segregated the best ones below on the basis of teaching method, subject coverage and more importantly active participation from the learner. I strongly believe that the difference between a coder and a rockstar coder is that the rockstar coder keeps practicing and does not stop when he runs into a problem. So what are the best guides which would help you in this journey to becoming a rockstar Android Developer? An easy and beginner-friendly course developed by Google to learn the basics and fundamental concepts of Android development very quickly. The official training guide for Android developers from Google is very useful for any beginner. The training mainly covers the basics, with plenty of coding examples. This in-class recording from Stanford is one of the best tutorials on Android Development out there, it focuses on practicing concepts while they are being taught. You can find the course in the above link. The course brings out the introduction of Android studio, Java code, and advanced Android features, and teaches you how to use maps in your APPs, how to store data permanently. This is another course which focuses on making the students practice coding while concepts are taught. It is for students who are new to programming and want to learn how to develop Android applications. You will acquaint some of the key principles behind Android architecture, and the processes involved in developing Android applications, Android development tools, and user interface design. By the end of the course, you will be able to create two simple applications. There are 75 videos in this tutorial. It covers everything from basic development knowledge to Android app creation, all the Android knowledge you need is covered in these 75 videos. After completing this entire series of tutorials, you will be able to create your own Android app and can publish it in the Play Store. These tutorials were created in 2018, so they are freshly brewed and up-to-date. The course here is broken up into bite-sized lessons (video and written) which you can follow at your own pace. Each course introduces a new concept, starting from the most basic of beginnings, all the way to advanced concepts. Whether you’re an absolute beginner or a pro, there is something here for you, the only drawback is that the course is paid. This course explains Android development in a suitable way for beginners and targets the latest version of Android. The Android app development course contains 35 hours of on-demand video, three articles, and a certificate for completion which is an added bonus. This is another Android app development course hosted at Udemy, The Complete Android Oreo Developer Course is a practical guide to develop “ any Android app you like” which covers both Java and Kotlin. You’ll grab this knowledge via 37.5 hours of video and 117 articles. The best thing about this course is Zero prior programming experience is required. I feel any of the above courses are more than enough for you to deep dive inside Android Development. I run an institute where I teach android. This blog will be a great help to my students. I’m definitely gonna share it with them. Very informative post.